What is Duac acne gel? What is Duac acne gel used for? Benzoyl peroxide, a medicine that causes the top layer of skin cells to break down and soften. The active ingredients in Duac acne gel prevent pimples from developing, pores from clogging and the sebaceous glands from producing excess oil, thus reducing oily skin. It may take four to six weeks of treatment before the full effect of this medicine on the acne is seen. This medicine is used to treat mild to moderate acne, also known as pimples or spots. Pimples are caused by an overproduction of sebum, which causes the skin to become oily and pores to clog, resulting in blackheads. Pimples develop when these blackheads become infected with acne bacteria. Acne usually occurs in the face but may also appear in other parts of the body, such as the neck and shoulders. Duac acne gel reduces blackheads and pimples, and helps prevent the formation of new impurities. The gel should be applied to clean, dry and undamaged skin once a day in the evening. Avoid contact with the eyes, nose and mouth. Wash your hands immediately after applying the gel. Attention: benzoyl peroxide may bleach hair and coloured fabrics such as clothing, towels and bed linen. Be careful to avoid contact with eyebrows and scalp, and do not get dressed before the gel has absorbed into the skin. Duac acne gel expires two months after opening. a small amount of gel applied once daily to the affected areas of the skin (one fingertip unit is enough to treat the entire face). Do not massage the gel into your skin. This medicine should not be used for longer than 12 weeks at a time. Read the package leaflet before use. This product is not suitable for use in children. Skin irritation (redness, burning sensation, dry patches, scaling, itching) at the application site. Increased sensitivity of the skin to UV light. Avoid exposure to direct sunlight and sunbeds in order to prevent sunburn and skin irritation. Consult a doctor if the side effects are bothersome or if you have side effects that are not listed here. See the package leaflet for further information on side effects. you are allergic to clindamycin or the related antibiotic lincomycin, benzoyl peroxide, or any other ingredient in this gel. This product may interact with other medicines. It is therefore important to tell the doctor what other medicines you are taking when you order. See the package leaflet for more information. 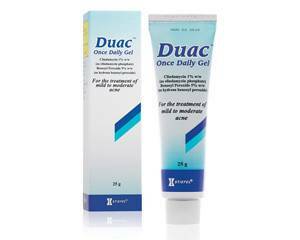 Duac acne gel should not be used by pregnant or breastfeeding women without consulting a doctor. This product does not interact with alcohol or affect your ability to drive safely.